[New for 2014, discontinued] Ok, so I got a little cranky yesterday when huffpo and eoline both ran with crazy headlines ushering in the new core breakthrough in ice cream technology. Really guys? You can't do five minutes of research before posting? Just go to Ben & Jerry's website and read how karamel sutra, the defacto core flavor, came out in 2002. No ground was broken yesterday, we're just merely introducing the next revision of this concept (which B&J's has already been testing in Europe for a few years now). Oy, anyway, rant over. There are three more core flavores to try. Our Nosh Show bud Junk Food Guy already gave the thumbs up to That's My Jam (our review here), and Nick has confirmed that Salty Caramel is pretty salty, so let's check out the other fudge core flavor. Hey, the core is actually sticking out on this one! I give it a sniff but I'm not really detecting anything, so I dig in. Hmmmm. It's not a great core, but on first impression it seems better than the Peanut Butter Fudge core. There is a bit of hazelnut funk to it, but it seems to have a bit more sweetness to it. Ok, hazelnut base first. I take a few bites and I like it. It's almost buttery. It's sweet, smooth, and different, definitely different, and in a good way. It's not crazy strong but I don't usually want that in a nut flavor. I want sweet first, then add in the flavor notes. The hazelnut base plus core is strange. Texturally, it's cool that the core is more thick like fudge than sauce, but I'm liking the flavor less and less as I go. Chocolate time: no complaints, lots of small but thick chocolate chips to dig through. I have no problem chowing down on this side. Chocolate + too much core = ummm, yeah, the core is starting to annoy me again. I swear it's getting more strange as I go down the pint. Uggg, that last fudge bite was kinda gross. Maybe I'm unrefined, or maybe, just maybe, these fudge cores just aren't that good. I feel like I'm gnawing on acorn shells or something.... ok, that was a bit harsh. Yeah, it seems yet again that the core is my least favorite part while the mixing of the two bases together is kind of fun. 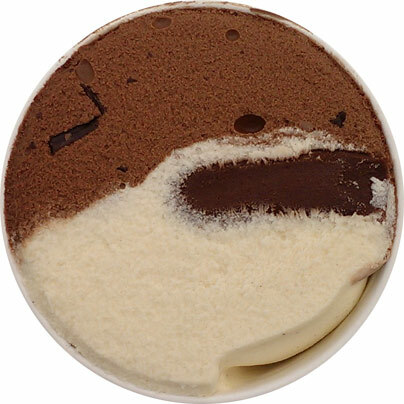 The mild hazelnut base seems to be the smoother/creamier side and that makes it a neat play off the crunch filled chocolate side. You can mess around with balancing the two bases out on your spoon in different ratios to find the perfect match of flavor, sweetness, and texture. Ok, I'm full for now. Sorry to be negative again. As always, all comments are welcome on this and the other new core flavors. On Second Scoop Recap: Chocolate chocolate chip side is fine. Hazelnut side is mild but pleasant. Core is kind of disgusting and may be seeping in to the other flavors. Sorry. This just doesn't work for me. These Core products just confuse me. 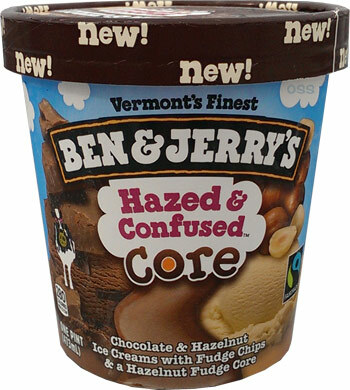 I agree with you on this one; I do really like this flavour and I would buy it but I think in all of the Ben n Jerry's core flavours the core seems to be the weakest part. The fudge core...its okay..but there's something 'play-doh' like about it; the hazelnut ice cream is definitely the star of the show in this one. I was in an online focus group survey for these core flavors. The package graphics have changed somewhat, and I remember there was another Core flavor called "Blond, James Blond" that must not have made the cut. It reminds me slightly of Ferrero Rocher chocolate if it was ice cream. The hazelnut is slight but I thought it worked. The chocolate just tasted like regular chocolate. 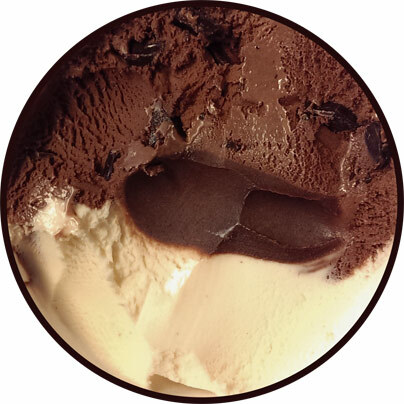 The core was good in the beginning since I was taking it with scoops of each flavor, but at the end when its just a ton of the core left at the bottom, the fudge gets pretty overpowering. I was also expecting the core to be in the center but it was really just all over the place in my pint. I sit here enjoying a pint of Dazed and Confused and realize how cranky and uptight you people are. This is an amazing Ice Cream and you "reviewers" seem overly critical of anything that has chocolate in it. Here's the SCOOP: This ice cream is amazing. The core is Nutella guys, but you weren't smart enough to figure that out. Now imagine nutella sandwhiched in between the best tasting vanilla and macadamia flavored ice cream you've ever laid a spoon on on side side, combined with chocolate ice cream drenched in chocolate chunks. How can you not like this? Unless, you're a CHOCOLATE SNOB and absolutely hate chocolate. To everyone who hasn't tried this yet (and if you're not a chocolate snob) buy it. You'll buy 5 more (like I did) and enjoy every second of it. Same goes for your review of "The Tonight Dough". Guys, are you intentionally trying to be controversial and opposite reality? You're doing a great job! But as reviewers who are to be taken seriuosly and trusted? I'll pass on your review, which I give 0 out of 10 stars. @Anon: oh, where to begin. For your "smart" comment, you may think it's nutella, but it's not. Some may find it similar, but it's not literally nutella. B&J wouldnt use vanillin for starters, nor is there any palm oil here, but I nitpick. Secondly, I didnt pick on the chocolate base here, my complaint is with the core. Third, the hazelnut side tastes like macadamia? Now who's not paying attention. Fourth, you spelled "sandwhiched" wrong. Fifth, I have no problem with you liking The Tonight Dough, but it's doesn't have the wow factor of Late Night Snack. Sixth, if you dont like our reviews, don't read them. Anon, I give your comment a 0/10 as well. You see, this ice cream first off is called Hazed & Confused. Secondly, it is a hazelnut ice cream and not a macadamia ice cream. Third, I was the reviewer of The Tonight Dough and said I did enjoy it. It could've been so much more if they had chosen to use different bases because their chocolate is well known for drowning out the mix-ins completely. Fourth, if you're going to try to insult us, please use spellcheck beforehand and get your facts straight. Lastly, have a great day and we're glad you enjoyed this ice cream because everyone has their own taste preferences.